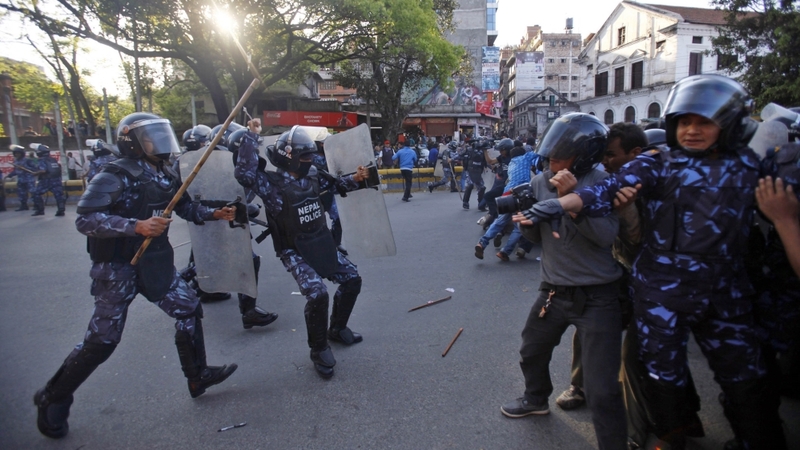 Kathmandu, Nepal – The Nepal government’s nationwide crackdown on a Maoist splinter group has raised fears of violence more than 10 years after the end of an armed communist rebellion. Up to 100 leaders and cadres of the Communist Party of Nepal (CPN), including its top leaders, have been jailed for their alleged role in pre-election violence. The party had boycotted the November general elections last year. The CPN leaders and many of its cadres once fought alongside the Maoist rebels during the decade-old civil war (1996-2006), but split from the main group after the latter decided to disband the People’s Liberation Army as part of a peace deal. Analysts fear the continued crackdown could trigger more violence from the group, which accuses the ruling Maoists of abandoning the path of “people’s revolution”. He has been repeatedly arrested allegedly for extortion, arson and explosion of improvised devices during and after the elections, in some cases targeting election candidates. Bishwakarma was released on September 25 following a Supreme Court directive, but dozens of party cadres still remain behind the bar. Across the country, the party’s cadres including district secretaries were arrested by the police. Last week, in Rolpa district, a former Maoist stronghold, police detained Santosh Subedi, the party’s district secretary when he was attending a funeral after the death of his comrade’s father. The CPN leaders call the current government led by Nepal Communist Party (NCP), of which the main Maoists are a part, a “social fascists”. “We have urged the government to release our cadres unconditionally and withdraw cases against them. We must be allowed to conduct our political activities,” said Gunaraj Lohani, the CPN leader. “The talk team doesn’t seem serious in resolving this issue,” he said. “The government is intent on suppressing our movement. It is not interested in addressing our demands to organise rallies and mass meetings,” he told Al Jazeera. “Our brief is to talk to more than 42 groups consisting of dissidents and engaged in conflict with the state. “We have already held talks with six groups. We will hold talks with three types of groups – those with whom previous governments have signed peace agreements that are yet to be implemented, those that are yet to agree on a deal, and new forces that have emerged after the promulgation of Constitution in 2015,” Pandey said. He urged the government to create an environment for talks by addressing the dissidents’ demands such as releasing their cadres. Led by Netra Bikram Chand, better known as “Biplab”, the hardline Maoist faction boycotted the parliamentary polls in which the former Maoist rebels and their ally, the Communist Party of Nepal (Unified Marxist-Leninist), won in a landslide. The CPN has a presence in most of the country’s 77 districts. Under its two fronts – underground and open – the party has mobilised cadres across the country. The party still calls for “unified people’s revolution” – a goal the former Maoists led by Pushpa Kamal Dahal or Prachanda has since abandoned in favour of parliamentary democracy. Prachanda currently serves as a co-chair of the ruling party and another former Maoist leader heads the interior ministry that has led the crackdown. Mani Thapa, a leader of the ruling Maoist party, said the government could have launched the crackdown fearing the CPN could be used by opposition and other forces against the government. “The party led by ‘Biplab’ could take advantage of the chaos, but I don’t think their leadership has any long-term vision and plan,” Thapa said. The CPN leaders claim they are the true political heirs of the Maoist “people’s war” waged between 1996 and 2006, which left over 16,000 people dead before arms were laid down in a peace deal. The group has vowed to revive the war-time “people’s government” and “people’s court” – an agenda the government fears may lead to instability and violence. Analysts say the Maoist splinter party is trying to cash in on the dissatisfaction among people regarding the government. “The fundamental problems of our society, which the Maoists vowed to change when they launched the war, remain the same,” said Sudheer Sharma, an authority on Nepal’s Maoist war and a leading commentator. Lohani, the dissident leader, said his party’s views diverged from those of his former comrades, who have since merged to form the ruling Nepal Communist Party. “The ‘people’s war’ ended our country’s feudalism. Instead of entering into the stage of capitalism, the country found itself mired in comprador capitalism,” he said. “The current form of the state allows foreign investors to exploit our natural resources,” he added. Though Lohani was cagey about his party’s strategy on the proposed rebellion, several cadres signalled that the party, instead of zeroing in on their campaign in rural areas would, mobilise its forces to attack urban centres. The government has accused the CPN of extorting business people, a charge denied by CPN’s Lohani. He said that talks are under way to unite left parties to tap into the dissatisfaction among people. “They might carry out attacks on government installations, but it’s hard to influence a larger section of society. I don’t think people are willing to support yet another insurgency,” Subedi told Al Jazeera. “They have resorted to extortion and justice via kangaroo courts. A bourgeois class has emerged within the party. So, I don’t think it could be successful in carrying out an armed revolution. “Some would be drawn to it on the basis of ideology while others, who were sidelined in the main Maoist party, will be attracted to it,” he said. “The Maoists launched a new experiment with the insurgency in 1996, but it largely failed to meet its stated goal. The war ended in a compromise. So many people may not find it attractive because that idea has already been tested in Nepal,” he said.